Mud-slinging traction makes for unstoppable fun. Big horsepower depends on it. In the mud, the key to traction is many components working together. Power. Steering. Tire grip. Articulation. 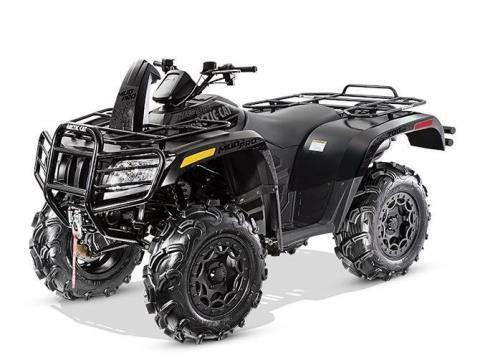 The Arctic Cat Mudpro’s give you everything to make sure your ATV is the dirtiest on the block. Race-Inspired Suspension When the terrain gets muddy, the MUD PRO gets going -- thanks to 10 inches of suspension travel, 14 inches of ground clearance, and a spring preload that's adjustable for five kinds of riding conditions. 28-Inch Maxxis Zilla Tires with Aluminum Beadlock Wheels Weighing up to 10 lbs. less than the competition, the Maxxis® Zilla is one of the lightest mud tires you’ll find. The aggressive tread pulls well, yet rides smooth on the trail. This tire combines high-speed performance and superb braking with a durable 6-ply rating. Snorkel Air Intake The elevated design pumps clean air to the engine, breathes life into the clutch, and keeps the CVT belt dry and cool so you can power through even the deepest holes. Heavy-Duty Front and Rear Bumpers Heavy-duty, steel front and rear bumpers with dual-tube construction help protect your chassis from light impact and keep brush and debris from your grill and lights. Automotive-Style Matte Paint Looks great. Lasts long. And adds a touch of class to every ride. High-quality automotive-style paint looks as good as it holds up.